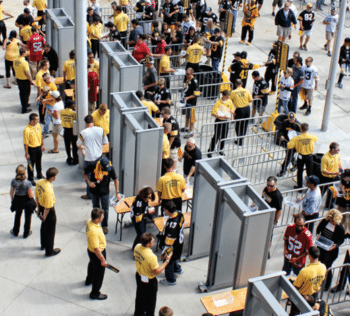 Walk-through and hand-held metal detectors are becoming an accepted form of security protection for schools, universities, event venues, government buildings and businesses throughout the nation. Although the technology for metal detectors has greatly advanced, a commercial security system using metal detectors is only as good as the metal detector solution used and the company that stands behind that product. Video surveillance, access controls and commercial security locks, integrated, provide a complete security system for your business, school or venue. Metal detectors, either hand-held or walk-through detectors add a level of contemporary security technology needed by many. Prevention of an incident is an important component of any sophisticated security system. Kenton Brothers recommends, sells, installs and services Garrett Metal Detectors. Garrett is the global leader of walk-through and hand-held commercial metal detection products. From the Olympic Games to law enforcement organizations across the nation, Garrett Metal Detectors are recognized as the preeminent technology in metal detection systems. For Kansas City-based Advanced Logistics Fulfillment, installment of a metal detection system was necessary to protect their assets as well as the assets of a recently acquired customer. Read how Kenton Brothers provided Garrett Metal Detectors as a means of securing and protecting their facility.